It rained till 0130 and then there was a bit more at 0400. We get up at 0720 and there is some drizzle which does not last long. Thunderbird 2 has lots of water in it, even though it is mostly protected by the solar panels. While Michael is letting the water out (by lowering the stern and pulling out the bung), the rope slips and the stern drops heavily into the water and takes on even more! Damn. Michael has to run around for about 10 minutes before all the water drains out. He thinks the rope slipped because it was so wet it did not grip on the winch like it normally does. We decide to head south using the tide and when we pull up the anchor, the chain is covered in weed. This takes Kelly ages to wash off with the deck wash. We leave at 0900 and motor the whole way as the wind was right on the nose. We have about 1 to 1.5 knots of assistance the entire way. 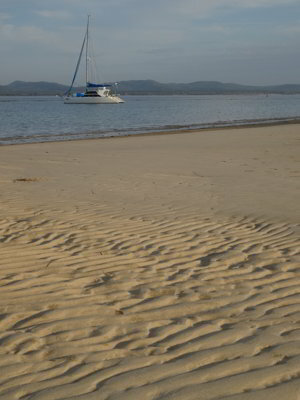 We anchor at 1115 south-east of Inskip Point and south of a small sand spit. This should be not covered at high tide we think. There are a few other boats here and a couple more come in later. One of these is a boat from New York, Dream Time II, owned by an Englishman and his Irish wife (naturalised Yanks). He comes over to make sure he has not anchored too close. Nice thing to do. We go to the sand spit with Veto and have a walk around. When we get back, Michael adds 22 litres of diesel to the fuel tank and 55 litres of water to the main tanks. He also cleans the watermaker filters. Later Leana comes in and anchors behind us. Michael takes over a USB memory stick with some photographs we have taken over the past few weeks of the boat. David invites us over for sundowners at 1700. At 1515 we move as one of the power boats that came in anchored too close to us and now after the tide has changed is only just over 20 metres from us. Wanchor! At 1545 it starts raining again and the wind is 17 to 22 knots. However once the rain sets in the wind drops to 5 knots. At 1645 it eases enough for Michael to take Veto to the sand spit. On the way back he drops into Leana and David suggests it is too wet to have drinks tonight. Michael agrees and we will have drinks in Mooloolaba tomorrow night instead. He also gives us back the USB stick and a DVD of a book Michael read last week. 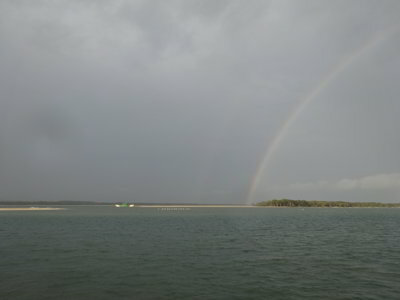 There is a nice rainbow as he comes back to the boat. We have showers and sundowners and Kelly makes roast pork rack and vegies. The wind blew 12 plus knots most of the night. We wake up at 0500, look at the weather forecast and the current wind here and at Double Island Point and decide to not leave today. We go back to bed. At least 10 boats crossed the Wide Bay Bar, reporting a two metre swell, very sloppy but no breaking waves, although a power cat (the wanchor next to us last night) had a wave break on him. Leana left and we watch his crossing via the AIS. We also watch two other boats, they went anywhere from 100 metres south of the centre line to 100 metres north. Michael takes Veto to the sand spit and we then have breakfast. Michael then watches the DVD David loaned us. This is called The Lincoln Lawyer and is from the book by Michael Connelly. Despite his misgivings, Michael says that it is very accurate to the book and we both enjoy it. Once the tide drops a bit, we all go to the sand spit and spend some time walking the whole length. 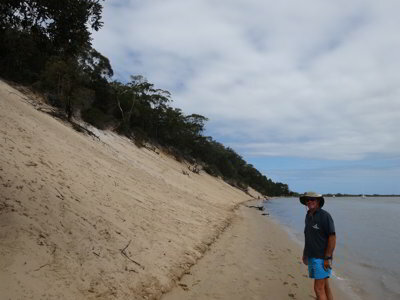 It is now very large and in fact you could walk to Inskip Point if you wanted to. Back on the boat we have lunch and Michael watches a movie from our HDD (Flight of the Phoenix - the new one). It is okay, but not has good as the original. At 1630 the wind is blowing 20 to 24 knots from the south-east, having increased all afternoon. We are glad we did not go this morning. It was supposed to be light here. There are now 15 boats here, all but one are yachts. One is Madiba who we spent a lot of time with earlier in the trip (although it is now occupied by Edward’s parents Roy and Jane). At 1715 Michael takes Veto to the sand again, it is very windy still. Later the wind drops quickly to 15 and then to 10 knots. We have sundowners and then a barbecue of Scotch fillet and sausages with salad. The wind drops to 7 knots. We send David an SMS and at 1930 he replies that he is still not at Mooloolaba. We end up watching three episodes of Twilight Zone before we go to bed, the first things we have watched off our hard drive this trip except for the movie earlier today. We go to bed at 2045. It was a calm night, though the wind got up to 8 to 12 knots by 0500. We get up then and Michael takes Veto to the sand. We leave at 0525 and motor out. We have to use two engines as the incoming tide is flowing at 3.5 knots. There are nine yachts leaving, including Madiba, Force Six and Dream Time II. At one spot we have 4.2 knots of tide against us! In the “Mad Mile” (which is really more than two nautical miles long), we have a little bit of chop on the beam, but it is probably the best we have had on our four crossings. Along here we let two yachts (including Madiba) pass us as they are going faster. Once we get to waypoint 2, the inner mark for the notorious Wide Bay Bar, we increase speed a bit. There are no breaking waves at all, not even on the shallow bits to the sides of the channel. There are not even any white caps. 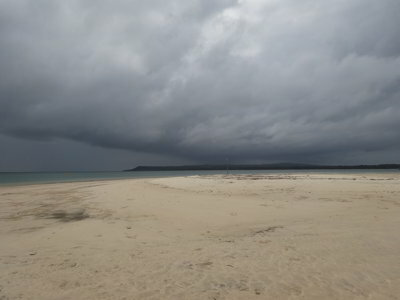 The swell is about one metre, with the occasional 1.5 metre. The minimum depth was 5.3 metres. The worse thing about this bar is that it is long, not a few hundred metres like most river bars. This one is over 1.5 nautical miles long, that is, over 3000 metres (3 kilometres) from start to finish. Again this is the best crossing we have had. We are over the bar just before 0700 and once outside we turn towards Double Island Point and pull out the genoa. 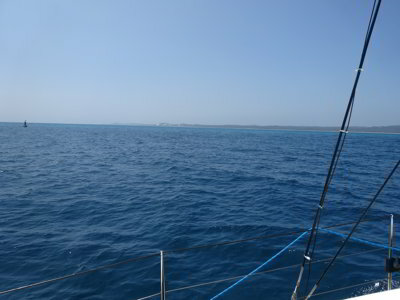 We have now about 9 knots of southerly wind but we are heading into a 1.5 knot current. We are doing 4.5 knots with one engine on at 3200 rpm. The wind increases to 10 to 13 knots and we increase speed to 4.9 to 5.1 knots. This is short lived as at 0830 when we near Double Island Point we have to turn towards the south and we need to pull the sail in as it is now right on the nose. It is also very sloppy, the forecast was for winds under 10 knots. At 0855 we have to put on the second engine as our speed has dropped to under 4 knots. We need to average 5.0 knots to get to Mooloolaba before dark. From here we need to average over 5.5 knots to get there by 1730. At 0945 we put the genoa back out as the wind has gone more south-east. 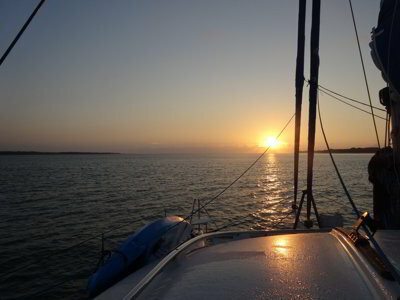 We are doing 5.8 knots into a 1.5 knot current with the wind 11 to 12 knots. It is a bit calmer here. At 1025 we see two humpback whales breaching a few hundred metres from us. They do one co-ordinated leap, both out of the water exactly in unison! We see more whales later on, as well as a hammerhead shark, a turtle and some dolphins. A bit later on the wind moves more to the east so we swap to the screecher. This increases our speed to 6.3 knots or so and we can turn off one engine. We motorsail like this till just before we get to the entrance to Mooloolaba at 1645. As we line up to enter, Leana leaves. David earlier phoned and said he was heading to the Gold Coast. We motor in and at 1715 we anchor in the anchorage. Michael takes Veto to the beach and then we have showers. Kelly orders some pizzas and Michael goes to collect them. The shop is just at the end of the nearest canal to us, so it only takes him 15 minutes to get them (we will have the leftovers for lunch or breakfast tomorrow). The pizzas are excellent! Michael writes up the blog and at 2100 we go to bed. We have decided to leave here tomorrow morning after previously thinking we were going to stay two nights. The reason is there is now a strong southerly forecast for Saturday. We have booked into The Boat Works for next Wednesday so we need to make sure we are close as possible on that morning. We get up at 0455 after a very restful night’s sleep. 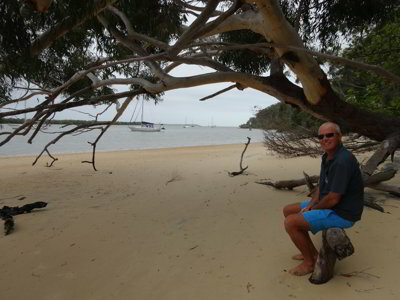 Michael takes Veto to the beach and also disposes of our rubbish and recycling. Kelly makes tea and coffee and at 0530 we motor out. As we leave, we notice an American yacht, Escape Velocity anchored near us. We saw this on AIS yesterday afternoon but did not see them when we came in as it was nearly dark. We have been following Marce and Jack’s blog on their round the world trip for at least four years. Three years ago they were dismasted leaving the Galapagos Islands. We have been in contact with them when they were in Sydney but never had the chance to catch up. Damn! There is a little more swell on the bar than last night but no problems at all. 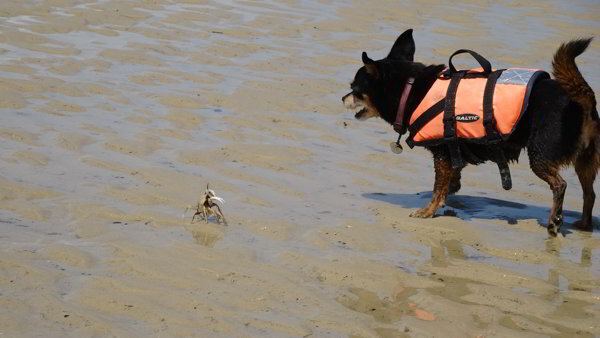 We head out around the headland and pull out the screecher. Again we have current against us. Today we will not have it with us for a minute, we should have had it for at least 6 hours. We are doing 5.9 knots with one engine on in 13 knots of wind from astern. The current later is 2.0 knots against us. The seas are calm. We get to the entrance to North East Channel at 0915. This is very shallow at the start. We are doing 5.6 knots into 1.2 knots of current. So far we have seen at least 8 humpback whales, many of the breaching. We see at least another 6 during the morning. 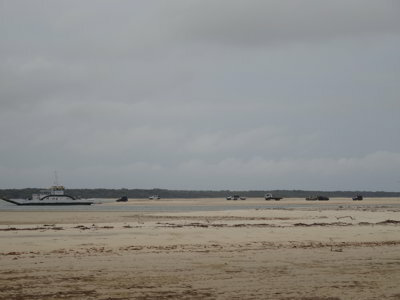 At 1105 we pass south of Bulwer on Moreton Island and swap the screecher to the port side. We drop speed a bit more as the current is now 2.4 knots. We pass Tangalooma at 1205. We have to go right to the southern end of Moreton Bay today as the wind is forecast to hit over 20 knots from the north-west and later tonight go to 25 knots south-easterly. The only place that will be protected from both these winds is near Russell Island. 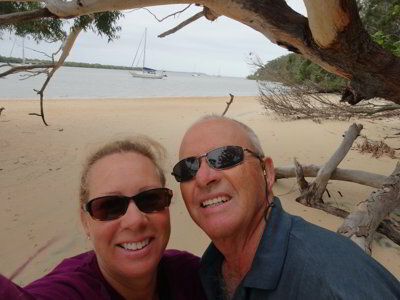 At Tangalooma we are past by MV Avatar. 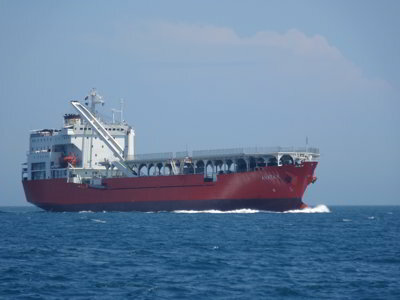 This is the ship from the Singapore Navy that we saw in Shoalwater Bay Military Training Area almost three weeks ago. The current hits 3.5 to 4.0 knots in the channel south of Tangalooma but once out of it, it drops back. We sail to the west of Peel Island. As we near here a very large storm approaches from the south-west. There is lightning and very heavy rain. The wind goes from 15 knots to 20 then drops back to 8. When the storm gets close, we pull in the sail and turn on the second engine. We get 35 knots of wind at 1530 and a bit of rain, but the storm mostly goes north of us and a little bit to the south. 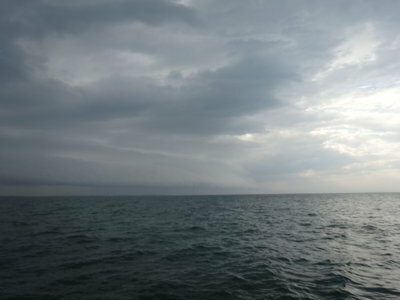 The wind goes all over the place, 9 knots to 3 to 32 and from north, then south-west, then north and back to north-east. We motor the rest of the way. We pass Blakesley Camp and then into the start of Canaipa Passage. There are 12 yachts anchored here. 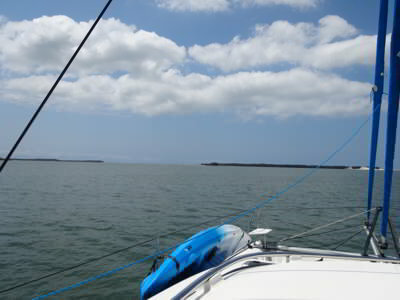 We try to anchor near the green channel marker but it ends up too shallow. We move a bit to the west and at 1800 anchor just past the green channel marker. It is now dark, the sunset was 1748 and the heavy cloud cover mean there is little twilight. 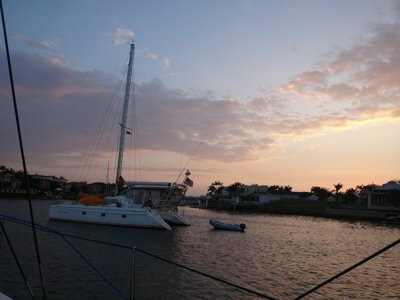 Kelly has started dinner before we anchor and once we are settled in, we have showers and then sundowners. It is very calm here. Kelly makes chorizo pasta, very nice. The past few days we have had problems with our auto pilot, with the fluxgate compass giving very erratic headings. This has meant we are changing course all the time and over correcting. Michael reads up on the manual and we decide that tomorrow morning when we leave we will attempt to fix by recalibrating the fluxgate compass. We go to bed at 2100. The change came at about 2330 with the wind going to the south-east and hitting 18 knots. Later at 0130 it hits 28 knots. Despite this it is fairly comfortable here, although our anchor alarm goes off a few times as we move about with the tide changing. We get up at 0710 and take Veto to the beach. Back on Catlypso we have breakfast. The wind is still around 22 knots. 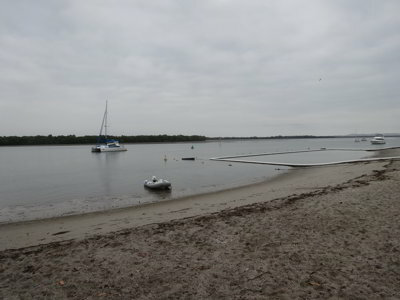 The tide is hard to figure, it seems to be about 2.5 hours after the Brisbane high/low tides. A few of the boats leave and at 0935 we up anchor. We do a 360 degree circle as we recalibrate the fluxgate compass. We head off and the auto pilot is working much better, with the heading being much more consistent. Seems it has worked. We have current with us till past Double Island when for a little bit we have it against us. Then we have it again with us. It is not a long way to Coffee Cliffs and we end up anchoring at 1155. We run around a bit before we find a good anchorage. The wind hit 22 knots again on the way. 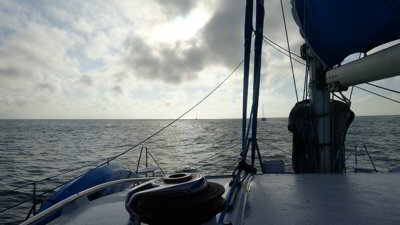 Once anchored we turn all over the place as the wind hits 24 knots and the tide is flowing at about 0.8 knots. We are about 60 metres off the shore and the water is pretty calm, even when the wind blows strong. Later the wind drops a lot, although there are still some strong gusts. We are taking our time as we have until Wednesday to get to Coomera. We have lunch and do some computer work. Michael also does some study for solar panels for our house. 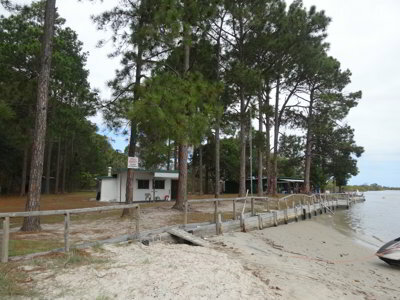 Later we go to the beach and then have a look at the Redlands RLS Fishing Club place up the waterway a little. Nice place! It is overcast and cool. The wind drops to 3 knots and it is very nice here. We go to the beach again later and then have showers and sundowners. Kelly makes creamy pasta for dinner. We watch some more Twilight Zone on TV, Michael has run out of books to read (has read 70 so far this trip). We get up at 0710 after a very calm night. It is sunny, but this only lasts a few hours. Michael goes to the beach with Veto and we then have breakfast. High tide here seems to be at 1000, about 20 minutes after Seaway high tide. We leave at 1015 and motor the short distance south to Slipping Sands. Once we get to the next intersection we again have tide against us, but it is not too bad. Obviously the tide comes in from this channel to Coffee Cliffs area. After we up anchor, at least 100 jet skis pass us, as we later find out, it was a charity run. We pull into Slipping Sands and anchor at the northern end of the anchorage. This is not as protected in some ways as Coffee Cliffs, as it is open to southerly and south-easterly winds. We anchor in 3.0 metres at 1055. There is a wanker in a ski boat (skanker) going around and around the anchorage at speed, but he soon stops once we make faces at him. The wind picks up a little to 8 to 13 knots from the south but it later drops to 3 knots. It is supposed to be from the north-east and light. There are lots of small boats here as well as a couple of houseboats and one yacht. A bunch of kayakers come in (they travelled as fast as us almost from Coffee Cliffs but they had a short cut). After lunch we go to the beach and walk up to the houses to the south (more fishing club places we think). We sit on the beach for a while as well. Later two jet skis come in and go to the houseboat nearest us. They ask if they have spare fuel but they do not. We call them over and sell them 10 litres as we have this to spare. This is how we found out that the jet skis we saw this morning were on a charity run. They filled up at Manly at the other end, but one of them has used a huge amount on the way back. We later go to assist a trailer sailor who ran aground trying to cut the corner into the anchorage, but as Michael goes over he frees himself. We go to the beach again as well, this time walking as far to the south and north as we can on the sand that is present at low tide. We then have showers and sundowners and Kelly cooks a flat chicken and vegies for dinner. We watch more Twilight Zone episodes and go to bed at 2130. We have an extremely calm night. It is overcast at 0800 when we get up. Michael takes Veto to the beach again and we then have breakfast. Kelly later does some cleaning while Michael updates the history page of the St George Scuba Club which has not been updated since mid-2014. He also does some planning for a few dive trips we are planning next year. We go to the beach again later and then at 1055 we leave. 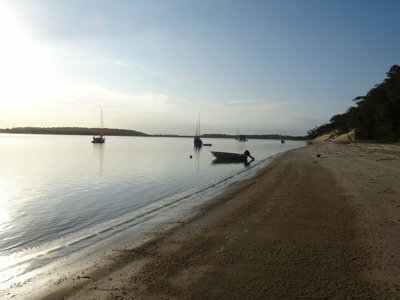 We motor the short distance to Jumpin Pin which is the passage between North and South Stradbroke Islands and gives access to the ocean. 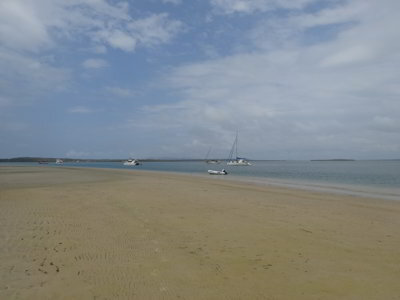 We anchor at 1140 towards the northern end of the sand spit between the ocean and the waterways. It is calm here then. 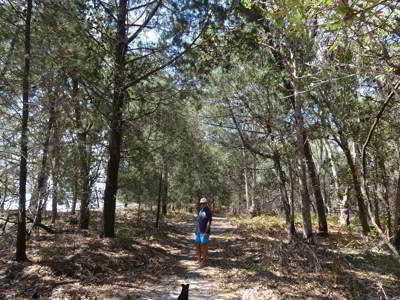 We go to the beach and walk to the top of some of the dunes, very nice views over the waterway and the ocean. We come back and have lunch. Today the weather has been all over the place, one moment sunny, then overcast, then windy and then calm. Around 1430 the wind picks up and blowing against the outgoing tide which is showing 2.5 knots on our trip log, it gets very uncomfortable. Kelly goes off in the dinghy and checks out the conditions further south. She comes back and reports it is much nicer, so we move and at 1445 we anchor near the green channel marker. Much better here, only 0.6 knot of current. 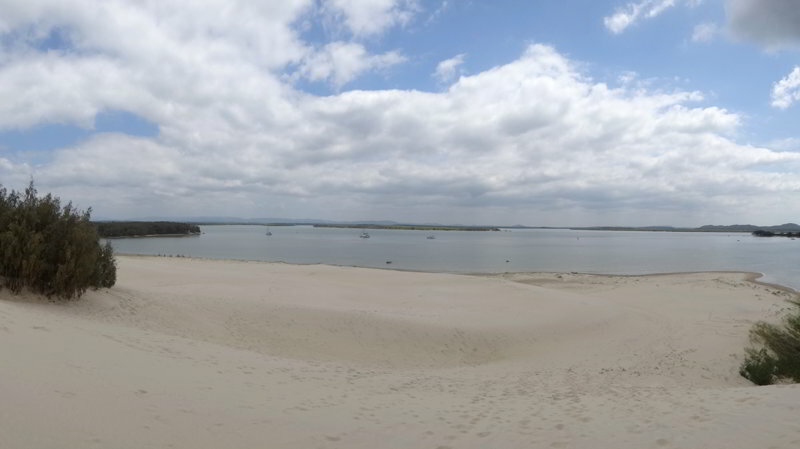 A panoramic photograph from the top of the dune at Jumpin Pin. The current when we were moving was over 3 knots against us! We relax for the rest of the afternoon, as well as going to the beach again for a walk. This is a much better spot. We later have showers, might as well use the hot water we have, and then sundowners. We have a barbecue with Scotch fillet and sausages and salad. We watch some more Twilight Zone episodes before bed. It was very calm last night and we get up at 0605 as the sun is now up well before 0500. Michael takes Veto to the beach for a long walk and after he gets back we have breakfast. It is sunny for the first time for days and already quite warm. 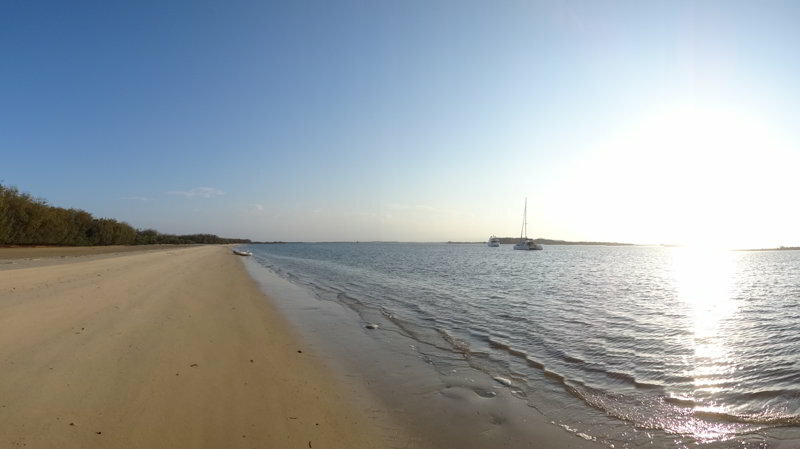 A panoramic photograph from the beach at Jumpin Pin. About 0900 we go for another walk, Kelly comes too this time. Once we are back on Catlypso we prepare to leave. At 0945 we up anchor and head off further south. We have the tide with us all the way, not that there is far to go. 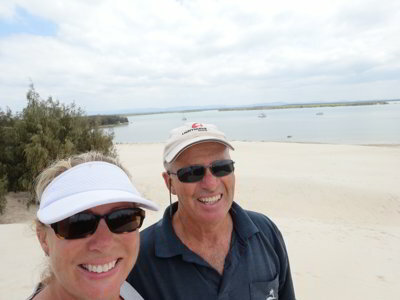 We anchor at 1035 just off the Tipplers Campground on South Stradbroke Island. 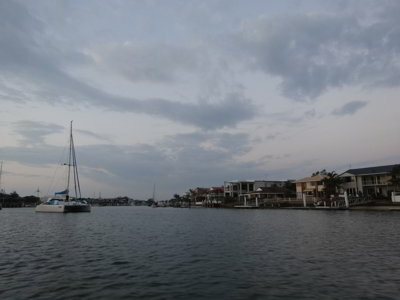 There is not much space here to anchor as the channel comes very close to the beach. In fact, some of the boats further north from here are anchored in the channel. We end up later on a little bit out in the channel too once the tide goes down a little and the wind picks up a bit. At the moment there is less than 7 knots of wind. After lunch we go to the shore to the south of us and walk along the beach and then on some of the walking/bike tracks. There are at least three properties here that are “owned” by boating clubs. They have some really nice amenities, and looks like you can camp at two of them. The wind picks up a bit and hits 15 to 17 knots south-easterly. It is nice here. We watch a movie from the HDD and then go for another walk, this time into the centre of the island. When we get back we have showers and sundowners and Kelly makes a nice curry chicken and rice. We watch another movie from the HDD before going to bed at 2130. It was a very calm night and we get up at 0635. Michael takes Veto to the beach while Kelly makes breakfast. After eating, we leave at 0715 and motor against the current towards Southport. 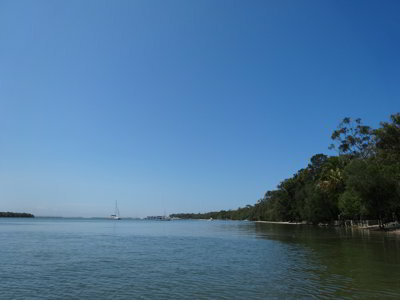 At the southern entrance to the Coomera River, we head upstream, this time with the tide. 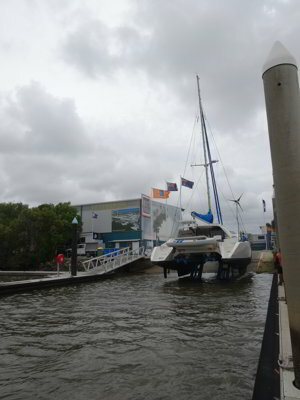 We arrive at The Boatworks at Coomera at 0940 and 10 minutes later we have been hauled out of the water by “Ellie”, the boatlift. Another 10 minutes or so and we are on the hardstand, two down from Heatwave (who you will recall were involved with us in a rescue of a jetskier at Gloucester Passage way back on 5 August). Soon after we were on the hard, the bloke we used in 2015 to polish the hulls, Peter, came and gave us a quote to polish all hulls and the upper deck. We accepted this and he said they would start today, but as the forecast for the next few days is for rain, we may have some problems. The surveyor, Greg, also comes. We want to get a new survey as to get a cheaper insurance and also for an agreed amount, we need to do this. It will work out cheaper too, even taking into account his fee. In the meantime, Michael flushes the watermaker (which he should have really done yesterday) and then cleans the hulls. There is no growth on them, but lots of mud/dirt from the very dirty water we have been in the past week or so. The props are also clean, they just need a wipe over, but the sail drives have some barnacles. This is strange as the area above the drives has the same antifoul and there are no barnacles here at all. Kelly earlier had started cleaning the earth plate which has a lot of barnacles on it (there is no antifoul here) but she had to stop when the surveyor came. 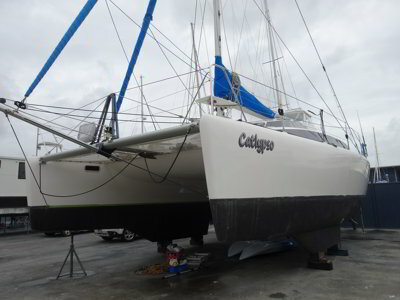 After lunch from the café, we acid wash the hulls as this has lessened the polishing cost. We use acid we bought from Bunnings in April. You just water it down and put it on with a soft broom and then wash it off. The hulls look so much better already. We then acid washed the decks as well. Michael also lowers the dinghy and washes the inside and acid washes the hull. At 1600 Kelly collects the courtesy car and we drive to her Mum’s place at Southport and collect Kelly’s Subaru Forester. We are back at 1800 and have showers, fantastic! The Boatworks has four “suites” which have toilets and showers. These are as good as any hotel we have stayed at. After this we drive to the Boathouse Hotel at Coomera. This is back near the freeway. Even though it is Wednesday, it is almost full. We order dinner and have a beer while waiting. The food comes along quicker than they forecast and is quite good and plentiful. Recommended! We are back by 2100 and we take Veto for a walk before going to bed. We woke up early when Colin from Lightwave arrived. He changed the prop set up. The Autostream folding props need to be installed a different way depending on the shaft rotation. Back in April Colin made an error and put them on the wrong way. This meant that we ended up with the wrong pitch angle for forward travel, meaning we needed to use about 3000 or 3200 rpm to achieve 6.0 knots compared to the original 2400 rpm. Once he does this, he then changes the throttle setup so that forward was forward and not reverse (he had changed in April once we discovered the error). While he is doing this, Michael removes the oil from the sail drives. We then take a sample to the Yanmar service agent here and he confirmed that we had water in the oil. We arrange for them to come and change the seals which is how the water has leaked in. The deck polishing starts, but a bit of rain stops it for a while. 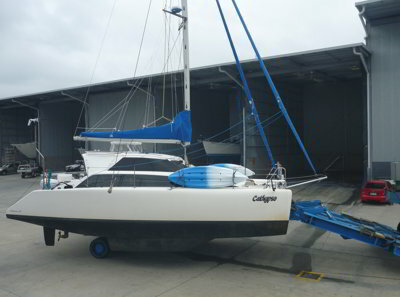 We also purchase some new antifoul for the sail drive as it is not in good condition after only six months. We purchased Hempel compared to the Jotun we have used each time before (we do not think any of them are good). Colin also tightens the raw water outlet into the exhaust which has been leaking and also put a small plate in next to the steering arm which has been squeaking badly. The mechanics come and remove the sail drives and take out the shafts. They take these back to their factory and replace the seals. 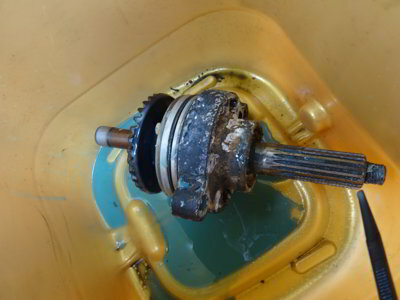 They later confirm that the inner seals (on the shaft itself) were shot and this is how the water leaked in. 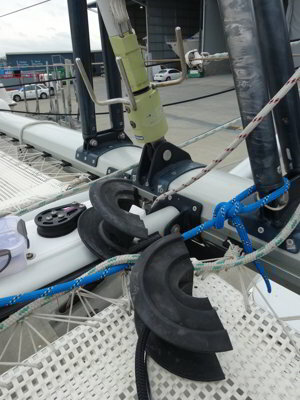 Michael later removes the genoa furling line and then the furler drum. This splits open after four bolts are removed. He gets the new line and installs it into the drum. This requires a knot in the end to stop it pulling out. He then reassembles it and we check that it works. Kelly also puts on three loads of washing and somehow, one of us misplaces the key to her Forester. From about 1030 we search and search, but we cannot find it. We backtrack our movements today, but we still cannot find it. We alert the office to our loss, but no one has handed any keys in. Once the mechanics come back with the shafts for the sail drives and reinstalls them, Michael refills the drives with oil. At 1630 we have showers, we are filthy, and at 1700 we go down to the river and have sundowners with Peter and Toni from Heatwave. We leave here at 1845 and back at Catlypso Kelly cooks chicken and pork schnitzel with mash potato. Kelly gets up at 0630 and takes Veto for a walk and also gets herself a coffee from the café (using one of the vouchers we got). Michael gets up later at 0710. We still have not found the keys, so after breakfast, Kelly calls the NRMA which arranges for the RACQ to come and open the car. He arrives fairly quickly and opens the car. The keys are not inside (as we suspected). 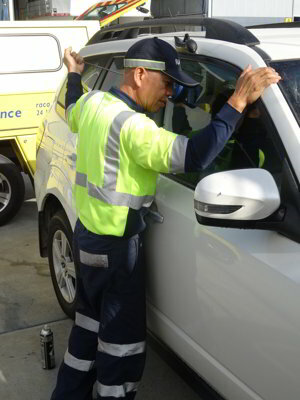 Kelly then rings a locksmith recommended by the RACQ patrolman and arranges for them to get a new key for the Forester. As soon as she sends an SMS with details of the car’s VIN, she gets a call from the office. They have the key! She rings the locksmith back cancelling the new key. Michael goes down and collects the key. Seems the cleaner found it in a bowl in the lounge near the bathroom suites. There is no way that we lost the key in the bowl. It seems that someone has found it and put it in the bowl rather than take to the office or even put on the table in the lounge. Michael had checked the lounge, but did not check the bowl. At 0900 Kelly goes off shopping. She also gets five containers of diesel (110 litres) and gas. When she comes back, Michael adds the fuel to the tank, it is still not full. We will get more on Sunday to refill the containers. Kelly put the food away. While she was making lunch, Michael walks up to one of the tenants and purchases a container of pickling agent for the watermaker. This cost $67. We will pickle the watermaker once we get closer to Sydney. After lunch, Michael cleans the sail drives and then paints them with one coat of antifoul. He also paints the area immediately around them. Kelly removes the helm clears and cleans them. It is very hot today and we spend the rest of the time under the boat reading. In the afternoon, Wayne from Axis Vitae, a Lightwave 45 which is near us, comes to say hello. We have not seen this boat before we came into The Boatwarks two days ago. Later Michael goes over and Wayne shows him some stainless steel cleaning stuff that he has used. Michael then walks up with Wayne to the chandlery just before it closes at 1600 and purchases some. It is called CleanAshine Rust Off gel. 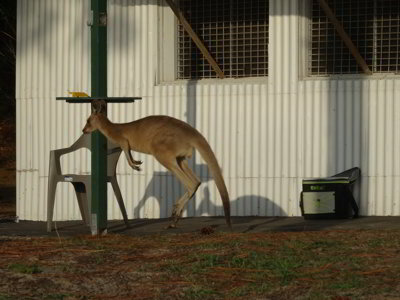 He tests on the very rusty ladder and it gives amazing results. We have showers and then walk to the river again and have drinks with Peter and Toni. When we come back we have a barbecue, Scotch fillet steak and sausages with salad. We go to bed at 2200. Queensland does not have daylight saving (the old joke was that the longtime Premier, Joh Bjelke-Petersen, thought the sun shone out of his a…hole and he was not getting up an hour earlier for anyone). As such, it is now light well before 0500. At 0520, Michael takes Veto for a walk and then comes back to bed. At 0700 we get up and have breakfast. After this Michael does a second coat on the saildrives. He also cleans the earth plate a bit more (not finished from Wednesday). After this we pull apart the anchor winch and service it. 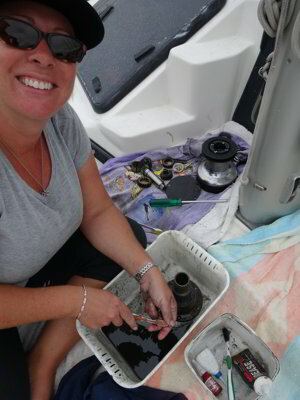 Michael then uses the gel to clean the stainless on the starboard side while Kelly pulls apart the port mast winch. Michael assists in a couple of bits, especially removing the bolts that hold it onto the mast. These are secured with some sort of glue and were very hard to remove. 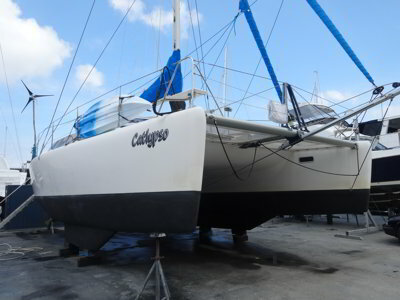 More work is done on polishing the hulls, they end up almost finished today. They also do some more work on the deck. After lunch, Michael does the stainless on the port side while Kelly does the starboard mast winch. The bolts for this are even harder to remove. Michael finishes the stainless and then redoes some small bits that are not fully clean. 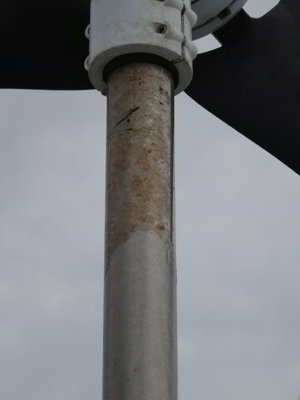 He later uses the boat hook with the paint brush taped to the end to do the top of the wind generator post. It has all come out looking great. We spend the next hour or so resting and reading under the boat. We have showers, we are filthy from the muck on the deck from the polishing. At 1720 we leave and drive to Kelly’s Mum’s place. We pass through a huge storm, it is pouring rain. It continues raining for three hours or so. We later get some take away Malaysian food for dinner. We watch some TV and stay the night. After we get up at 0700 I take Veto for a walk along the local canal and we then have breakfast. We leave at 0830 and drive back to The Boatworks. On the way we get 110 litres of diesel and 8 litres of ULP. As we expected, the polishing blokes have not turned up even though it has not rained at all this morning. At about 1000 it starts raining and about 1030 we go to the lounge to read and for Kelly to do some computer work related to a job she has been offered. It starts raining quite heavily and keeps on raining all day. Kelly puts a load of our towels in the washing machine, they have gotten dirty and wet because of the rain. During a short break in the rain, Michael goes and makes lunch for us, but that is the only real break all day. There is free Wi-Fi here (we can access it from the boat anyway) so Kelly is using it. At 1615 there is a slight easing in the rain so we make a break for it and go back to Catlypso. It is cold (18⁰C), we are wet and it has started raining heavily again. We also discover that the 240 volt power is off. Michael goes out in the rain and finds the circuit breaker has tripped. We have power again. We find we cannot even get a TV signal, stupid aerial. It is raining too much to go and have a shower, so we have sundowners and Kelly makes lasagne for dinner. We end up watching a few episodes of Yes Minister from the HDD. It rains for most of the night but not as heavy as it did during the afternoon. It must have stopped about 0300 for a couple of hours and then rained for an hour or more. There has been no rain since 0530. We get up at 07360, it is cold and windy. We have breakfast and then Kelly does a last load of washing. She also takes Veto for a walk when she gets her free coffee (you get two vouchers when you book in and the bloke next to us gave us one when he left). Michael gets the HDD again from Peter on Heatwave as he did not copy everything he wanted to last Saturday night when he gave Peter some Google Earth images and more. Kelly does the washing up. At 1010 the polishing bloke still has not arrived despite the owner promising he would be here at 0900. Kelly sends him a message but gets no reply. Michael finishes cleaning the earth plate, flushes the watermaker and tops up the water. Finally at 1200 the bloke comes and washes the top decks and hulls then polishes the underside. He is still finishing this when Ellie arrives to lift us and take us back into the water. We put the two kayaks back on the bow area, lift the dinghy back up and are now ready to go. We are lifted at 1430 and 15 minutes later we are in the water. Michael is taking Catlypso to Bums Bay and Kelly will drive around and meet him there. As usual, the cooling water takes ages to come through, but in the end it all appears good. Michael heads off at 1455. The speed is much higher now that we have the props back on properly. He is doing about 5.3 knots into a 0.7 knot current at 2400 rpm, exactly what it should be. The port controls are a bit stiff so Michael will need to check that out later. It is not raining, but it is cold and very windy, over 28 knots as we were launched. Right on the two hour mark and when the port engine has been in use for an hour, the water temperature alarm goes off. Michael swaps to the starboard engine. What is wrong? Fifteen minutes later, the starboard alarm goes off. Luckily when Michael switches back to the port one it works okay. As he nears Bums Bay, Kelly calls as she has been tracking the AIS on her phone. Michael tells her that he might only have one engine when manoeuvring into the wharf to pick her up. As he comes into Bums Bay, he tries the starboard engine and it works okay. 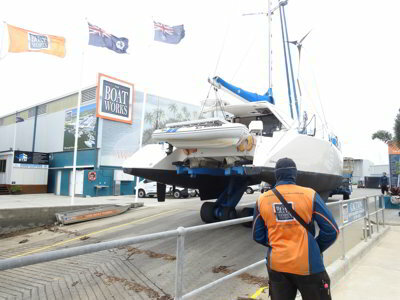 As he nears the wharf, a bloke jumps in his dinghy to head to his boat and Kelly hitches a ride out to meet Catlypso. 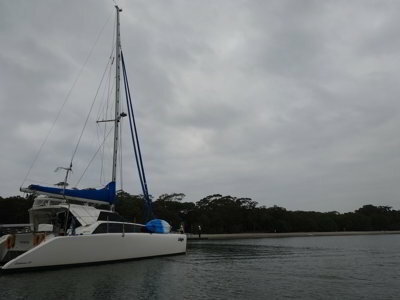 It is now very dark due to the threatening rain (we had a little bit), so we do not want to go right into the bay as Kelly has already looked and there is not much room. We anchor off the southern end of the spit almost in the channel. It is 1730. There are three other Lightwave 38 cats here, Axis Mundi, Hummingbird and Starfish. 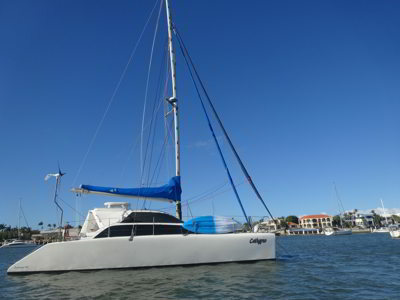 After we anchor, VMR comes and moves a yacht near us that is very close to another yacht. Neither of them have people on them and we do not see anyone there all week. The wind is blowing at least 28 knots constantly. Michael has a cup of tea rather than a beer. Kelly makes dinner, chicken fajitas. It is a bit sloppy here as we have some current pushing us a bit side on to the wind. We go to bed at 2045.